The VoyagerGS 9590 from Honeywell is a single-line laser scanner with the usual Voyager quality and unrivalled ergonomics. The pistol grip design of the Voyager fits perfectly into your hand. The VoyagerGS 9590 is the latest model of this popular handheld scanner series and offers excellent scanning comfort in a sturdy housing. This single-line laser scanner is the ideal handheld scanner for all standard 1D barcodes. The scanner is perfect for various applications ranging from POS, data collection to medical applications. For improved scanning speed with reliable data transmission, the VoyagerGS 9590 combines the patented automatic infrared activation with an extended depth of field. Users scan the barcodes at a distance of up to 305 mm and transmit the collected data either over the keyboard wedge, serial or USB interface. The scanner is also equipped with the patented CodeGate technology that allows data transmission with a single press of a button. This is especially useful when users have to select barcodes from a menu list. The correct codes can be confirmed and transmitted with CodeGate. If the device is used as a presentation scanner, the integrated automatic stand switch will prove to be extremely useful. The VoyagerGS 9590 switches automatically from handheld mode to presentation mode. A space-saving wall mounting bracket is an optional alternative to the flexible stand. The VoyagerGS 9590 is configured with the barcodes from the user manual, or with the free MetroSet2 software over an RS232 or USB interface. The VoyagerGS 9590 adapts individually to various areas: the VoyagerGS 9590 formats barcode data according to the requirements of your host system. 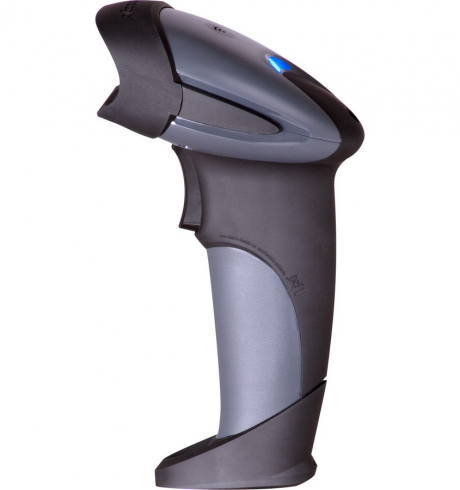 The VoyagerGS 9590 is a barcode scanner with extra value: the optional EAS function saves time and money – EAS security labels from items are deactivated when scanned.